[SINGAPORE] Planemaker Boeing continues to see a strong market, one underpinned by robust replacement demand and traffic growth, despite a recent spate of order cancellations in the aviation industry and a challenging operating environment for airlines. Its chief operating officer Dennis Muilenburg said: "We actually see cancellations and deferrals well below historic levels right now across our Boeing portfolio." Cancellations for the world's biggest plane-maker have hovered in the range of 3 to 5 per cent a year. Boeing's European rival Airbus has come up against a number of cancellations this year, including that for a hefty order by Emirates for 70 of the upcoming A350 XWB aircraft; that order would have been worth about US$16 billion at 2007 list prices. Closer to home, budget carrier Tiger Airways cancelled orders for nine A320s that were due for delivery this year and the next, citing over-capacity in the region. However, it placed a fresh order for at least 37 A320neos, to be delivered from 2018. And Airbus recently terminated Skymark Airlines' order for six double-decker A380s, reportedly because the Japan-based airline could not raise the funds to pay for the planes. Boeing has not emerged unscathed either, having racked up cancellations and conversions for a total of 54 B737s this year. But, even as carriers in the Asia-Pacific battle headwinds in the form of stubbornly high jet fuel prices, stiff competition and sliding yields, Mr Muilenburg remains bullish on the long-term prospects of the fast-growing region, citing Boeing's projections that the Asia-Pacific fleet will nearly triple in two decades to 14,750 airplanes in 2032. "The market growth is as strong as ever. The replacement demand is stronger than ever," he said. The International Air Transport Association expects global passenger demand growth (in revenue-passenger-km) to rise by 5.9 per cent this year over last year, and freight volumes to edge up 3.1 per cent. Today, 70 to 80 per cent of Boeing's commercial planes are sold outside the US, fuelled by strong demand from markets such as the Asia-Pacific and the Middle East, signalling a shift from the days when orders came largely from its homebase and Europe. The Asia-Pacific now single-handledly accounts for the biggest chunk of backlog for the US-based group, "probably in the 30-40 per cent range", with a list of clients that include Singapore Airlines and its regional wing SilkAir. A similar shift has become equally evident in Boeing's defence business in the last five years; the growth in the Asia-Pacific and the Middle East is helping to offset the smaller defence budgets in the US and Europe. In fact, 30 per cent of its defense business comes from outside the US these days, up from just seven per cent five years ago. Mr Muilenburg said that Boeing has a strong defence line-up for the global market in its P-8 and the new KC-46A tanker, for example. Meanwhile, operational efficiencies derived from Boeing's portfolio of next-generation commercial aircraft are also driving replacement demand, which accounts for nearly half of its orders. The narrow-body 737 MAX will cut jet fuel usage, a major expense for carriers, by 14 per cent. The lightweight, mid-size 787 uses some 20 per cent less fuel than today's similarly sized planes; the new 777X, which builds on the widely-used 777 aircraft, is being touted as 10 to 15 per cent more efficient. Boeing's confidence in the marketplace is one reason it is ramping up production for its narrow-body 737 and the 787, dubbed the Dreamliner. 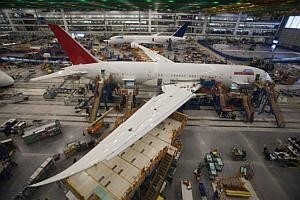 Boeing will produce 12 Dreamliners a month by 2016, up from 10 currently. This will increase to 14 a month before the end of the decade. Its production rate for the 737, now at 42 a month, will be raised to 47 a month by 2017. The 787-10 variant enters the market in 2018, while the first 737 MAX will be delivered in 2017. Meanwhile, the 777X is expected to enter into service in 2020. Gulf carriers Emirates, Qatar and Etihad have all placed huge orders for the 777X since its debut at the Dubai Airshow last November. Boeing has a total commercial backlog of 5,237 aircraft worth some US$377 billion. This year, it expects to deliver between 715 and 725 planes, having already delivered 342 in the first six months of the year. Its net orders for the year as at Aug 12 stood at 833 aircraft, of which two-thirds were for the 737 - pipping Airbus. As at the end of last month, the European plane maker had net orders for 705 planes, largely for A320 and A321 aircraft, after taking into account cancellations and conversions. Commercial sales aside, Boeing recently announced a Singapore-based joint venture (JV) with SIA Engineering Co (SIAEC) to provide fleet-management services to airlines in the Asia-Pacific. The joint venture, expected to be set up by year-end, will leverage SIAEC's facilities and handle SIA's fleet of 27 777-300ERs and Scoot's upcoming 20 Dreamliners. Eventually, the JV will also service aircraft such as the 737 as the group envisions catering to the region's carriers across Boeing's product portfolio. Mr Muilenburg said: "We're excited about the prospects there. It's just another sign of the growth opportunity in this region and another sign of a maturing, productive partnership with SIA." He declined to disclose the amount being invested in the JV, but said it required significant capital investment, and would add to Boeing's topline and bottomline. "We anticipate this will be a growing business, and one that will allow us to add to the aerospace employment levels here in Singapore," he added.